The word cruciate means “to cross over” or “form a cross.” The cruciate ligaments are two bands of fibrous tissue located within each knee joint. They join the femur and tibia (the bones above and below the knee joint) together so that the knee works as a hinged joint. One ligament runs from the inside to the outside the knee joint and the other from the outside to the inside, crossing over each other in the middle. In the dog, the ligaments are called the cranial and caudal cruciate ligament. In dogs, the most common knee injury is a rupture of the cranial cruciate ligament. Humans have a similar anatomical structure to the knee, but the ligaments are called the anterior and posterior cruciate ligaments. Anterior cruciate ligament rupture is a common knee injury of athletes. How does a cranial cruciate injury occur? Based on its anatomy, the knee joint is a “hinge joint”. It is relatively unstable because there are no interlocking bones in the joint. Instead it is held together by several ligaments, including the cruciate ligaments, which allow it to move back and forth like a hinge, but restrict its side-to-side motion. Acute or traumatic cruciate rupture is caused by a twisting injury to the knee joint. This occurs most often when the dog (or athlete) is running and suddenly changes direction. This places the majority of the body weight on the knee joint, and excessive rotational and shearing forces are placed on the cruciate ligaments. This injury usually affects the anterior or cranial (front) ligament. A cruciate ligament rupture is usually extremely painful and the knee joint becomes unstable, resulting in lameness. Obese dogs appear to be more predisposed to developing a cruciate rupture. In these dogs, the injury may occur with minor trauma to the knee, such as stumbling over a rock while walking. Dogs with other knee problems such as a luxating patella (see the Client Education Handout “Luxating Patella”) may also be predisposed to rupturing their cruciate ligaments. A more chronic form of cruciate damage can occur due to progressive weakening of the ligaments as a result of repeated trauma or arthritic disease. Initially, the ligament becomes stretched or partially torn and lameness may be only slight and intermittent. With continued use of the joint, the condition gradually gets worse until a complete rupture occurs. With traumatic cruciate rupture, the usual history is that the dog was running and suddenly stopped or cried out and was then unable to bear weight on the affected leg. Many pets will “toe touch” and place only a small amount of weight on the injured leg. 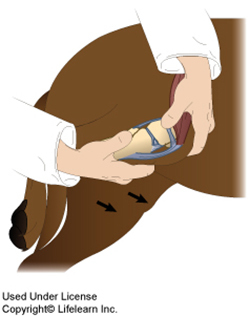 During the lameness examination, the veterinarian will try to demonstrate a particular movement, called a cranial or anterior drawer sign. This abnormal forward movement of the tibia (lower leg bone) in front of the femur (thigh bone) indicates laxity in the knee joint. It may be necessary to administer a sedative to relax the dog enough that the veterinarian can perform this test. Other diagnostic tests such as radiographs (x-rays) may also be necessary. Inside the knee joint are pieces of cartilage called menisci. 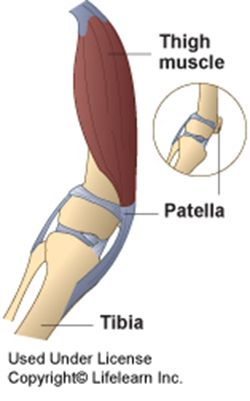 The menisci act as shock absorbers between the femur and tibia. The menisci are often damaged when the cruciate ligaments rupture. They are usually repaired at the same time as the ligament surgery. Dogs weighing less than 10 kg (22 lbs.) may heal without surgery, provided they have severe exercise restriction such as strict cage rest for six weeks. Dogs over 10 kg (22 lbs.) usually require surgery to stabilize the knee. Unfortunately, most dogs will eventually require surgery to correct this painful injury. There are various surgical techniques performed to stabilize the knee joint following cruciate rupture. The surgeon inspects the joint, removing fragments of the ruptured ligament and repairing the menisci if needed, then fashions an artificial ligament to stabilize the joint and prevent abnormal motion. Most often the artificial ligament is placed outside the joint capsule of the knee joint (called an ‘extracapsular repair’). There is a newer surgical technique available called a tibial plateau leveling osteotomy (TPLO) that is especially beneficial for larger, more athletic dogs. Your veterinarian will discuss the best treatment option for your pet. It is important that your dog have limited activity for six to eight weeks after surgery. The activity restriction may be less if a TPLO has been performed. Provided you are able to carry out your veterinarian’s instructions, good function should return to the limb within three months. Unfortunately, regardless of the technique used to stabilize the joint, arthritis is likely to develop in the joint as your dog ages. Arthritis develops more slowly and to a lesser degree if the dog undergoes surgery. Weight control and nutritional supplements such as glucosamine / chondroitin may help delay the onset of arthritis in your pet. Many dogs will receive physical therapy after the surgery to speed recovery and reduce complications. Your veterinarian will discuss your pet’s recommended post-operative care with you prior to surgery. Obesity or excess weight can predispose dogs to cruciate ligament rupture. If your dog is overweight, the post-surgical recovery time will be much longer. Obesity also greatly increases the risk of injury to the other knee, especially during the recuperation period. Weight loss is as important as surgery in ensuring rapid return to normal function, as well as being a preventive measure to help protect your dog against this debilitating injury. This entry was posted in Caring for your pet, News, Tips & advice, Veterinary Services and tagged canine, dogs, joint health. Bookmark the permalink.